Not sure if you heard of a store named Overstock. I personally like the prices and heard that they are really good with the shipping. Today we'll take a look at unique function of the Overstock app - the Lotto. Read full review... I like to do shopping online. There are many reasons, including possibly better prices and number of reviews or specific products. It's also always nice to have an app for a store you like. 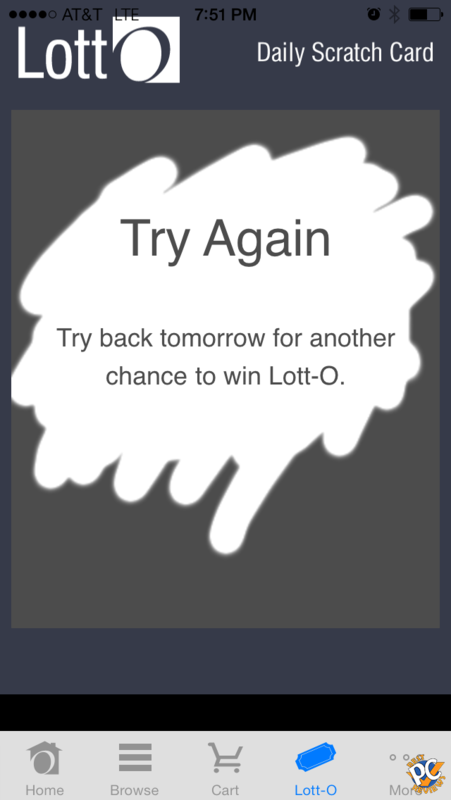 What caught my attention in Overstock app is the Lotto function. Pretty much everyday you have a chance to get a special or a good deal. You play the lotto just like you play lottos anywhere. All you need to do is scratch (not literary) your screen and then you'll see the results. You are probably excited now as I was when I found out about the lotto, but so far I did not get any exciting deals. I've been playing it for months now and lately have been trying my luck every single day. So far I've good $10 off $100 order, $20 off $200 order, and $25 off $150 order. These are not bad, but to me they sound more like a good special than any lotto. I still like overstock.com and definitely will buy furniture there, but I wish the Lotto function actually had something I could call a lottery winning. Hopefully overstock will make some changes and may be give $50 off $100 order with a 1% chance of winning that. Now there is a possibility that I was just not that lucky. Please share here what deals you got through Lotto on the Overstock app. Just leave your comments down below.